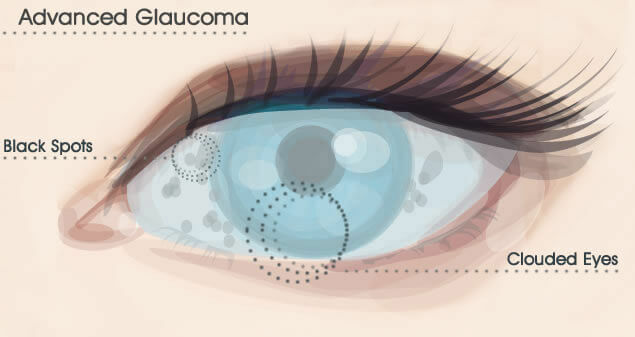 Glaucoma is a group of eye diseases that affect the optic nerve, which communicates vision from the eye to the brain. Damage to the optic nerve can cause vision loss. The pressure inside the eye is called intraocular pressure (IOP). A normal IOP can range from 10-21 mm Hg. An increase in intraocular pressure is the most important risk factor and the most common sign of glaucoma. At the front of the eye, there is a small space called the anterior chamber. Clear fluid, known as the aqueous humor, flows in and out to nourish the tissues. When glaucoma occurs, the fluid drains slowly out of the eye, causing the fluid to build up and the intraocular pressure to increase. Uncontrolled pressure can result in damage to the optic nerve. Half of the people with glaucoma are usually not aware they have the condition until they experience a severe loss of vision. In angle-closure glaucoma, the normal drainage canals within the eye are blocked. Angle-closure glaucoma can be acute (sudden) or chronic (long-lasting). In acute angle-closure glaucoma, a sudden increase in IOP occurs because of the buildup of fluid known as the aqueous humor. Acute angle-closure glaucoma is considered an emergency because optic nerve damage and vision loss can occur within hours of the onset of the problem. Chronic angle-closure glaucoma may cause vision damage without symptoms. Most people with glaucoma do not notice symptoms until they begin to have significant vision loss. Small blind spots begin to develop, usually in the peripheral or side vision. Blindness from glaucoma can result if the optic nerve is totally destroyed. Sudden increases in IOP, especially with acute angle-closure glaucoma, may result in blurred vision, halos around lights, severe eye pain, headache, abdominal pain, nausea and vomiting. Treatment is designed to lower the IOP by reducing the production of, or increasing the outflow of, aqueous humor. Depending on the type of glaucoma, medications or surgery are used. In most cases, the best prevention for glaucoma is early detection. If detected early, vision loss and blindness may be prevented. Anyone older than 20 years of age should have a glaucoma screening. Periodic eye exams are recommended for the rest of your life to help prevent and identify glaucoma, especially if you have certain risk factors, such as a family history of glaucoma. Although glaucoma cannot be cured, it can be controlled. People with glaucoma need to have regular eye examinations and usually need to continue treatment for the rest of their lives. Untreated acute glaucoma results in permanent vision loss. Untreated chronic glaucoma can progress to blindness. Early diagnosis and treatment usually results in excellent success and the vision is saved. How Do I Get Started with Glaucoma Treatments? Dr. Joseph Selem and the staff at The Selem Center for Ophthalmology & Plastic Surgery would be happy to help you set up a private consultation to discuss glaucoma. Schedule an appointment online or call us at 305-444-0221.